14 locations to divest in May! We now have over 600 people registered to switch to fossil free banks on Divestment Day on May 3rd, with events in more than 14 locations across Australia! Lend Lease recently withdrew their joint-bid to build and finance the Abbott Point Coal Terminal expansion (AP-X) on the Great Barrier Reef. Ten days later, Anglo American pulled out too, leaving just 2 companies involved at AP-X. Meanwhile over in Norway, the world’s largest sovereign wealth fund is considering divesting from fossil fuels. And the Victorian Uniting Church’s fund manager – UCA Funds Management – is divesting from thermal coal and unconventional oil and gas. But as major investors at home and abroad wake up to the risks of fossil fuels, new research reveals that, since 2008, the Big 4 Banks have loaned almost $19 billion to new coal and gas projects in Australia, many on the Great Barrier Reef. It’s time show the big banks that we need to move beyond fossil fuels. Already 600 of you have registered to close your Big 4 account on the 2nd and 3rd of May and switch to a fossil free bank – but we need more people! We we want you to be part of this historic moment. Click here to find your nearest event and register today, then LIKE and SHARE our image to invite others to join you. Once you register, our friends at FossilFree.com.au can give you a call to talk you through the divestment process. Then, on the 2nd and 3rd of May, we’ll all join forces to send the strongest divestment message Australia’s big banks have ever heard. 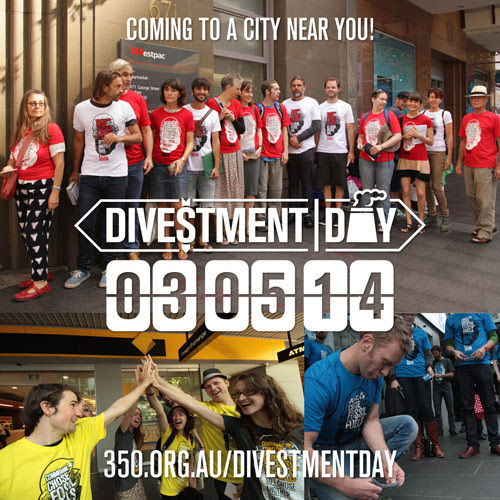 Locate your nearest divestment event here. If you’re not ready to close your account on the 2nd or 3rd OR you’ve already divested, please still join us! You can print out a copy of this letter to tell your bank that you’ll be leaving them or if you have already moved to fossil free bank use this letter to tell them why you’ve joined them, then join your nearest event for the fun, photos and celebrations. And don’t forget, you don’t have to be with the Big 4 to participate. Checkout Market Forces’ great comparison table to see whether your bank lends to coal and gas. If they do, we hope you’ll join us for d-day! Good luck with your preparations and thanks so much for using your dollars and cents to build a fossil free future! Can’t wait to see you in May! Charlie, Blair, Aaron, Josh and co.